by NineInchNachos on 9/16/2008 @ 8:04am Ladies and gentlemen, the art history lesson for the day is Caravaggio's depiction of the crucifixion of Saint Peter. If I alone had been made the victim of these attacks, I should not take one moment of the Senateâ€™s time for their consideration, and I believe that other Senators who have been unjustly and unfairly assailed, as I have been, hold the same attitude upon this that I do. Neither the clamor of the mob nor the voice of power will ever turn me by the breadth of a hair from the course I mark out for myself, guided by such knowledge as I can obtain and controlled and directed by a solemn conviction of right and duty. by Erik on 9/16/2008 @ 11:22am Wow. Tacomic ventures into state politics. You should send it to Eyman. He might like it. by NineInchNachos on 9/16/2008 @ 11:36am "Entertaining Tacomic this week, but I don't understand the monkey suit, maybe I'm missing something. " he's like a barbie doll only of the male gender (if there was ever such a thing). I feel as though I must push out a Rossi cartoon before returning to the womb like warmth of Tacoma centric cartoons. beware the forehead! the foreeeeeeee head of dooom! purchase the t-shirt on the melon store! 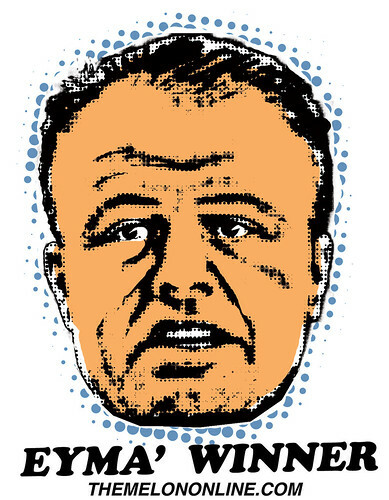 by NineInchNachos on 4/14/2010 @ 2:12pm "You'd think Eyman would have enough work on his hands getting the restoration of Initiative 960 � which required a two-thirds vote by legislators to raise taxes � on the November ballot. But no. Now he's filed eight new initiatives seeking to roll back the products of I-960's suspension: higher taxes on candy, gum, beer, soda, bottled water, tobacco and service businesses. He's even targeting a tax banks pay on the money they earn on mortgage loan fees." by L.S.Erhardt on 4/14/2010 @ 3:59pm Good for him! I'm sorry, but the idiots in Olympia have this coming since they ignored the will of the People and suspended 960. Actually, every legislator who voted "yes" to suspend 960 needs to lose their seat. by Crenshaw Sepulveda on 4/14/2010 @ 4:51pm I am fairly certain our fine legislators were just following the law, or the loop holes in the law. So now Eyeman wants to close the loopholes. You can't expect Eyeman to cover everything in one ballot measure, how is the poor guy going to make a living if he can't spin off more of these ballot measures. Win or lose Eyeman will make a buck. I'm just sorry the legislature found no way to specifically tax the profits from ballot measures. by NineInchNachos on 4/14/2010 @ 4:54pm everytime i hear "idiots in Olympia" I want to karate chop something in the forehead. by L.S.Erhardt on 4/14/2010 @ 5:14pm a karate chop to the head of your state legislator would be appropriate. Perhaps some sense will be knocked back in. Interesting. When liberals take political action it's to advance a social cause. When conservatives take political action it's to line their own pockets. There's a fair and balanced POV. by Crenshaw Sepulveda on 4/14/2010 @ 9:23pm Couldn't have said it better myself, fredo. It is a shame but the liberals have to pick up the slack where the christians seem to have fallen down as far as social causes are concerned. Fair and Balanced are my middle names which is quite a mouth full when your name is Crenshaw Sepulveda.